Specific rotator cuff exercises to add to your weight training program. Regardless of your sport, adding specific rotator cuff exercises in order to build shoulder strength will benefit you in many ways. The rotator cuff is the main muscular stabilizer of your shoulder and is an extremely important group of muscles. Strengthening this area will help provide more strength, control, and stability. 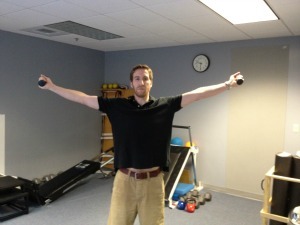 Rotator cuff exercises are a necessity for any well balanced shoulder strengthening program. The rotator cuff is actually a group of four muscles: the supraspinatus, subscapularis, infraspinatus, and the teres minor. All four of these muscles originate on the shoulder blade and attach to the top aspect of the humerus (upper arm) bone. They are relatively small in nature, and thus, are more susceptible to injury due to the large amount of forces that are placed through them. This is especially true for the supraspinatus muscle, as this is the muscle most likely to suffer a rotator cuff injury. 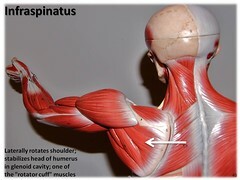 These muscles are primarily responsible for rotation motions at the shoulder. 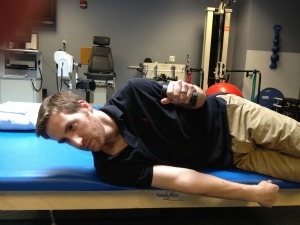 External rotation is, when your arm is at your side with elbow at 90 degrees, you hand moves away from your waist. Internal rotation is the opposite, where your hand will move towards your waist. These motions are also affected by the position of the humerus bone. 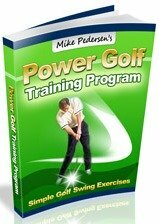 During the golf swing (right handed), your right shoulder will externally rotate during the backswing, while your left arm internally rotates. The exact opposite occurs during the follow through. The infraspinatus and teres minor are primarily responsible for external rotation while the subscapularis is primarily involved with internal rotation. The supraspinatus contributes to external rotation, but it also helps initiate lifting of your arm. FYI, some of these rotator cuff exercises are also listed on the Shoulder Strengthening page, but many are not. Also, Resistance bands or dumbells will be needed to perform these shoulder strengthening exercises. -You will need either an exercise band or cable column machine to perform this exercise. The band can be wrapped around a pole or door handle at approx. the height of your elbow when you are standing. -For the right arm, grab the band with your right hand and step away from where the band is attached to increase the tension. The outside of your right shoulder should be facing the band attachment point. -Keep your arm at your side, with elbow bent to 90 degrees and rotate your arm/shoulder until your right palm comes in contact with your midsection. -For the left shoulder, grab the band with your left and turn around to face the opposite direction and perform the same shoulder motion. -Similar setup to internal rotation, but the exact opposite motion. 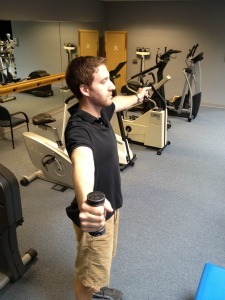 To exercise the right arm, stand with the outside of your left shoulder facing the attachment point of the resistance. -Keep your arm at your side, with elbow bent to 90 degrees and move your right away from your body by pivoting at your shoulder. -Simply turn 180 degrees and face the opposite direction to perform the exercise on the left. To recruit more muscle fibers, place a small towel roll between the exercising arm and your side. 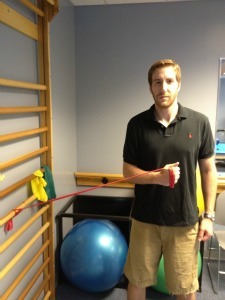 -Grab each end of a band with each hand, wrapping it around your hand a few times if you need more resistance. -Position your arms at your sides, with elbows bent to 90 degrees. There should be a small amount of tension on the band at this starting position. -Externally rotate both shoulders (keep from the elbow up at your side, but move your forearms and hands away from each other. 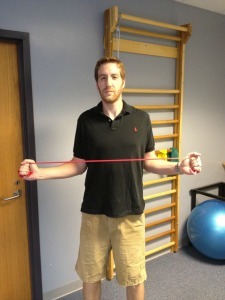 Your shoulder is the hinge) causing the band to tighten up significantly. -Hold briefly and then return to the starting position. 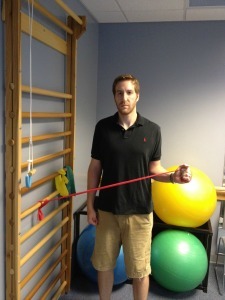 -This rotator cuff exercise will get the most out of your external rotators due to the effects of gravity. 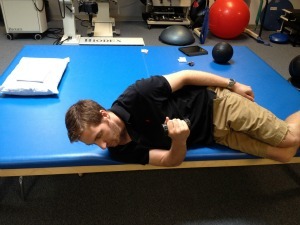 To work the right side, start by lying on the ground or exercise bench with your left side down. -Grab a relatively light dumbbell (2-10 lbs. depending on the person), and have your right arm resting against your side, with elbow bent to 90 degrees. The dumbbell in your right hand should be resting against your stomach at the starting position. -Just like the previous exercises, externally rotate at your shoulder, keeping your arm against your side. Your right hand should move towards the ceiling. -If you want to recruit more muscle fibers, place a small towel roll between your top arm and your side. -To work the right side, lie on the ground or bench with the right side down. -Grab a larger weight than you would for external rotation and hold it in your right hand, with your right arm close to your side and elbow bent to 90 degrees. -Pivot at your shoulder, lifting the weight until it comes in contact with your stomach. -Begin in standing, holding relatively light weights (1-8 lbs.) in each hand. -Lift the weights to shoulder level, with your arms essentially making a V pattern if you looked down from above, with your chest being at the point of the V.
-When you elevate your arms, make sure your thumbs are pointing to the ceiling. -Perform the same scaption motion mentioned above but after you perform 10-15 reps of both arms together, hold your left arm in the elevated position while you perform 10-15 more reps only on the right. -Once the right side is done, keep that arm elevated and perform 10-15 reps on the left side only. -Holding light weights (1-5#) in each hand, cross your arms (form an "X") so that your right hand is against your left pelvic bone, and your left is against your right pelvic bone. -Transition from the "X" to a "Y" with your arms, ending with both of your palms facing the ceiling. Return to the "X" and repeat. As I mentioned above, rotator cuff exercises are a must for any well balanced shoulder strengthening program. These muscles are responsible for some very specific shoulder motions, but because they are small in size, they need to be strengthened accordingly. 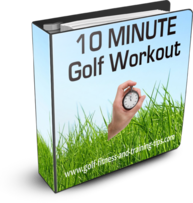 A well balanced golf weight training program should focus not only on rotator cuff exercises, but on larger muscles such as the pecs and mid back muscles as well. All of these muscles help contribute to shoulder motion.